The perfect fuel for your AK-74 range day! 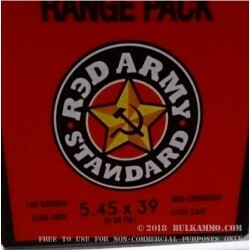 Red Army Standard’s 5.45x39 FMJ rounds are ideal for feeding your AK-74 or other suitably chambered rifle. These Red Army rounds feature a 69-grain, bi-metal full metal jacket projectile and comes loaded in a Berdan-primed, noncorrosive steel case. These cases feature a lacquered case for better long-term storage, feeding and extraction in a variety of firearms, not just the AK platform. These rounds also incorporate a sealed primer and neck for better corrosion resistance. 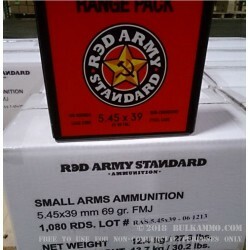 Each case includes 180 rounds of 5.45x39mm Red Army Standard. Originally created to compete with the NATO 5.56x45 round as a smaller, faster alternative to 7.62x39, the 5.45x39 offers similar performance ballistically and is designed for use in the AK-74—Aptly named for the year it was designed.